E-Crown stands for electronic crown. 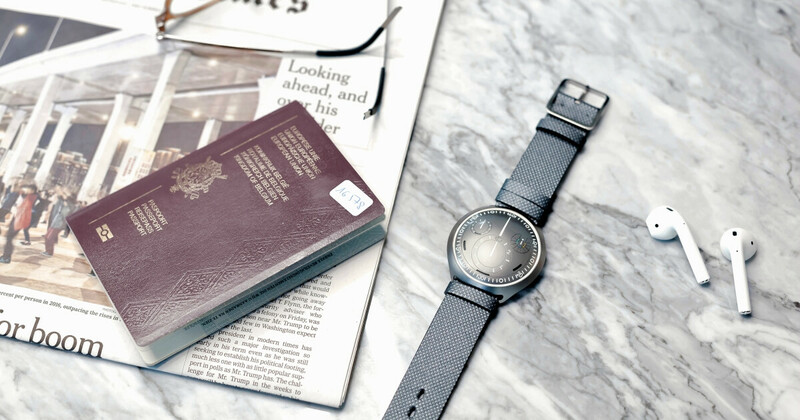 The technology, developed by Ressence, replaces the crown’s function by an automated setup system. e-Crown is self- learning by registering the time set manually. The technology is autonomous in its energy supply by using wrist movements to operate. e-Crown is discretionary and does not interrupt the gear train from barrel to hands. Combined with the e-Crown app, the technology offers unseen convenience and user experience in fine mechanical watchmaking. In 1842 Adrien Philippe invented a mechanism for watches which allowed them to be wound and set by means of a crown rather than a key. A small but crucial innovation back then. It took 176 years and a forward-thinking company to challenge this status quo. Created, engineered and developed in house, Ressence introduces the e-Crown technology. Ressence took everything back to the drawing board to create revolutions in convenience and performance for fine-watchmaking enthusiasts. e- Crown is a cutting-edge electro-mechanical embedded system that interfaces the mechanical base movement with the in-house ROCS module. It never interferes with the gear train from the barrel to the hands. e-Crown replaces the traditional crown’s setup functions of a mechanical watch and takes fine-watchmaking to the next level. 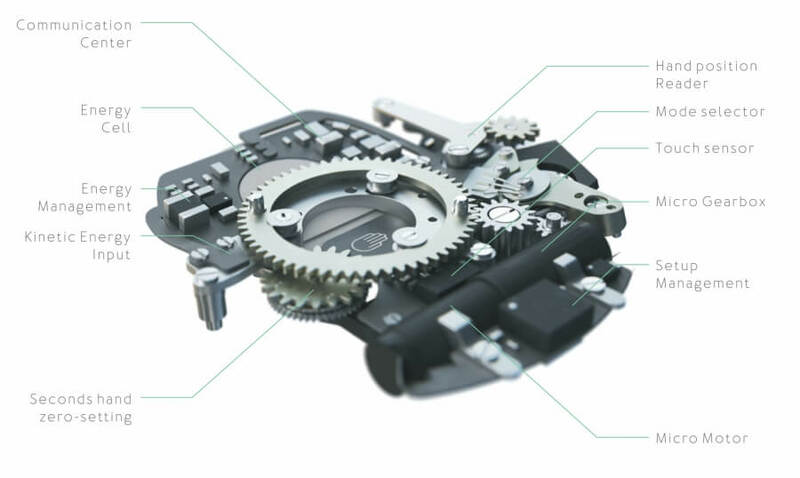 E-Crown automatically sets and adjusts your mechanical watch to the right time. Driven by user experience, it offers the trust and precision of electronics combined with the empathy and beauty of mechanical engineering. It acts as an electro-mechanical assistance the same way an automated gearbox does in a car. Developed as a discretionary technology, e-Crown can be switched off or on without affecting the watch. The latter still and always runs fully mechanically powered by a mechanical base movement. 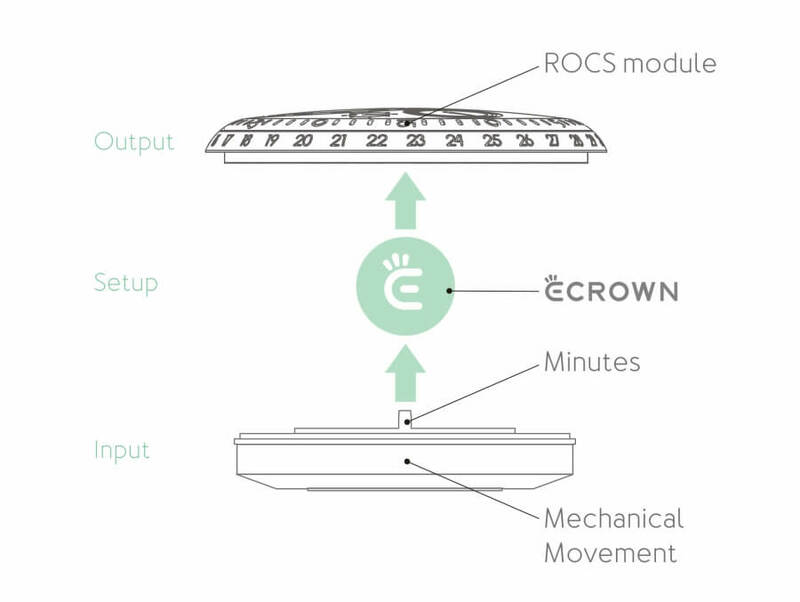 E-Crown registers the time set manually via the case back lever. It becomes the reference time for future monitoring, automatic setting and adjusting. e-Crown monitors at least once a day the time indicated by the graphical hands on the dial. The disc’s positions will then be adjusted automatically (if needed) as long as the movement of the watch is running. When the watch is not worn and the movement stops, e-Crown will put itself in sleep mode and wake up as soon as the watch is back on the wrist. e-Crown will then automatically set the mechanical watch to the right time (based on the registered time). The e-Crown® technology is able to set and register multiple time zones. E-Crown first uses kinetic and, if necessary, photovoltaic energy to run. The kinetic generator transforms wrist movements into energy. When required, triple junction photovoltaic cells, hidden behind 10 micro-shutters on the dial, will use the outside light as energy source. The e-Crown technology is therefore self- sufficient. A fundamental quality in the nomad world of today. E-Crown is activated and controlled by tapping the glass of your watch, offering a new sense of touch and user-friendliness to mechanical watches. Additionally, Ressence developed the e-Crown app to reach an unseen level of convenience and modernity. Using Bluetooth to connect with e-Crown, the app displays a scroll down list of cities to choose from but most importantly enables a multiple time zones setting accurate to the second. 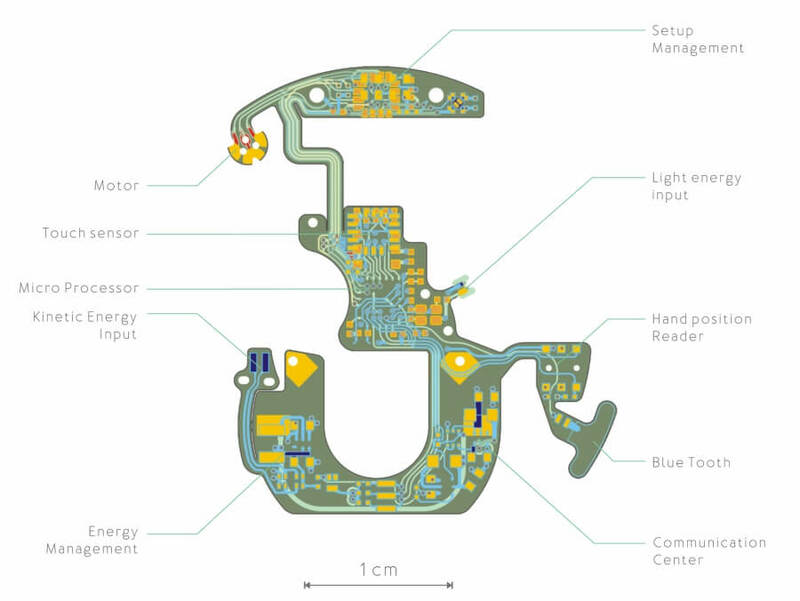 The e-Crown cluster, composed of 87 components, is the state-of-the-art miniaturised electro-mechanical system that manages the different e-Crown functionalities. The ingenuity lays in its system architecture and components that only need 1,8 joules of energy per day. Every component meets two very challenging requirements: extremely small and very low power consuming. Most components meet aerospace or medical standards and were custom-built for Ressence. A four-layered 0,25mm thick flexible custom-built PCB carries and connects all the components together. 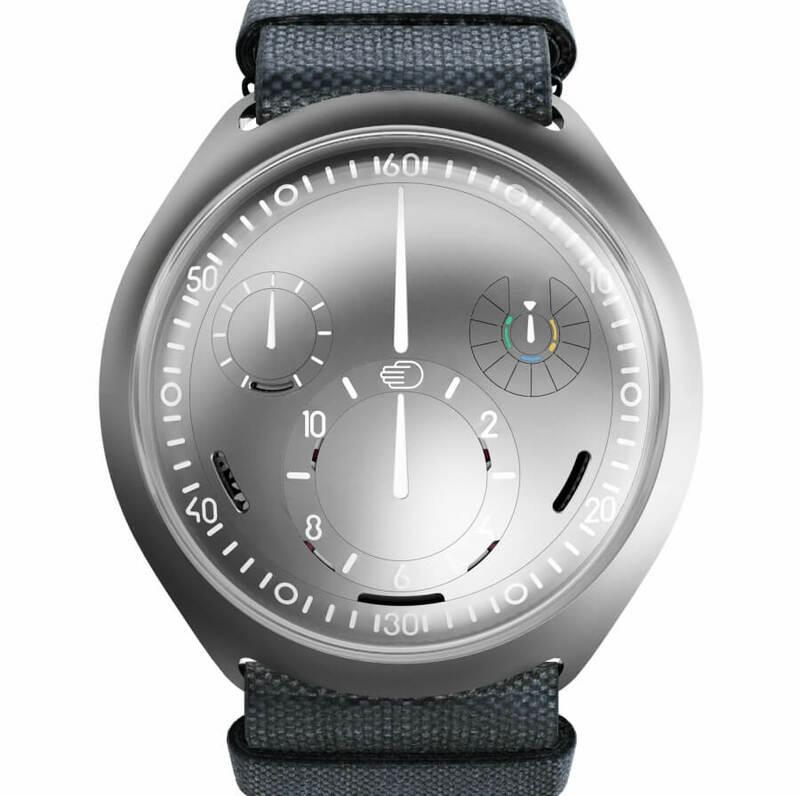 Ressence’s new technology promises an exciting future without compromise. The Type 2 e- Crown Concept is the next logical step in the company’s journey towards user-centric innovative mechanical fine watches. The Ressence Type 2 e-Crown Concept watch showcases the tremendous potential of its automated time setting technology called e-Crown. With its redefined patented dial system (ROCS), lightweight titanium construction, and sleek design, the Type 2 e- Crown Concept watch is at the fore-front of modern fine-watchmaking. 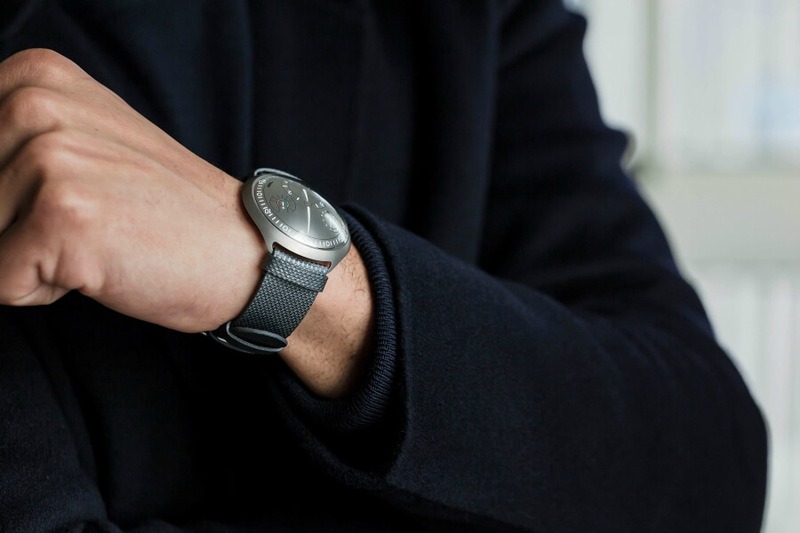 The watch illustrates Ressence’s vision on advanced fine-watchmaking by previewing its upcoming Type 2. “Fine-watchmaking must embrace new technologies to bring back functionality and excitement for the new generations.” Tony Fadell, iPod inventor, Nest founder and Ressence tech coach. “The best way to envision the future of fine-watchmaking is by creating it.” Benoît Mintiens, Ressence founder and creative mind. Just set once the time of your Type 2 e-Crown Concept via the lever on the case back and you are ready to go. No need to think about setting or adjusting your watch anymore, the Type 2 e-Crown Concept does it for you. And when operating, the e-Crown technology, combined with the Ressence display by discs, is simply magical. The main disc, as well as the auxiliary discs, revolve effortlessly and automatically, behaving like fast-forwarded moons around a planet. The Type 2 e-Crown Concept, a 500 components mechanical wonder, truly offers the ultimate 21st century horological experience. 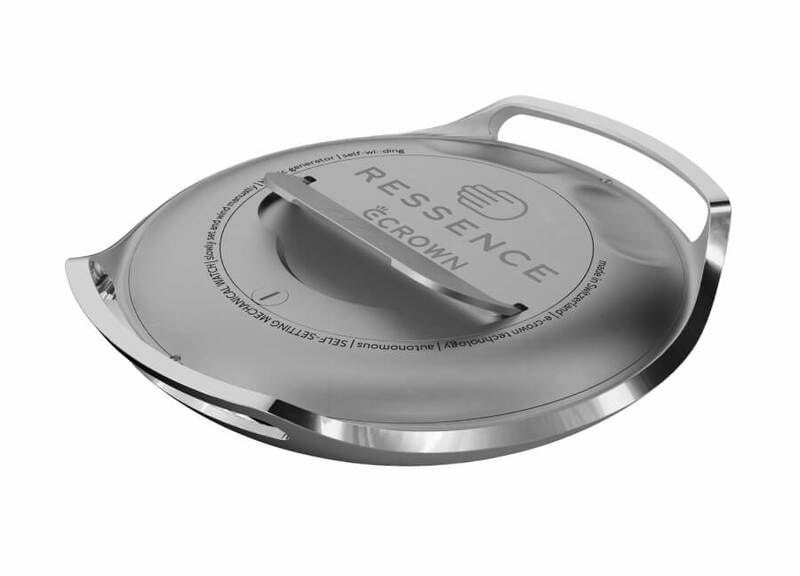 The Type 2 e-Crown Concept introduces an all‐new generation of ROCS, which stands for Ressence Orbital Convex System. 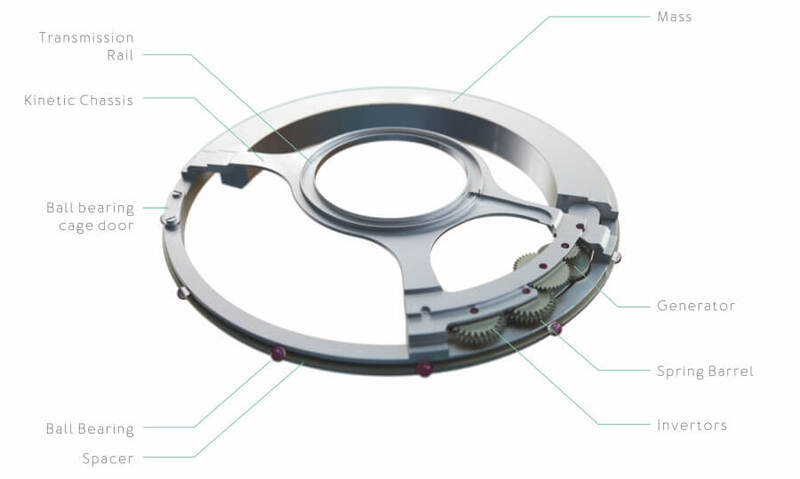 Fully designed and developed in-house, this unique horological module is composed of grade 5 Titanium co-planar discs and rings of different sizes that are spherical with a radius of 75mm (like a tennis ball). Each of the time indications of the Type 2 e-Crown Concept is generated by the ROCS from the information provided by the automatic base movement. 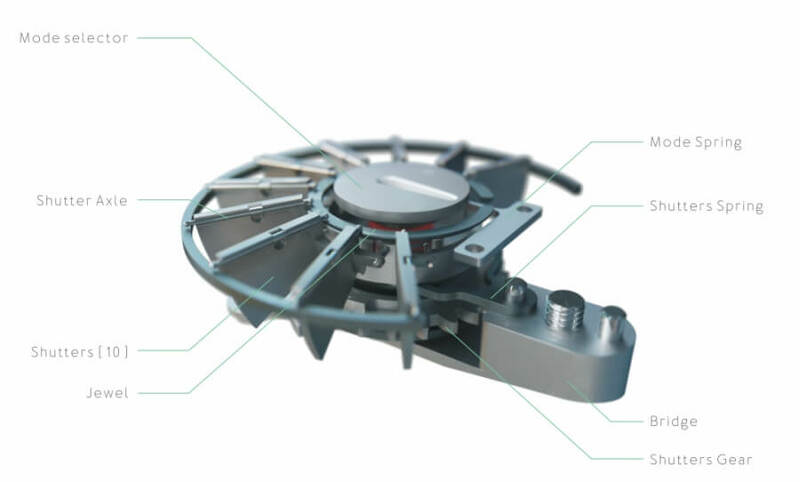 On Type 2 e-Crown Concept, all discs are mounted on jewel micro-ball bearings for a slimmer architecture and the gaps between the discs are reduced to 35 microns for a seamless design. The Type 2 e-Crown Concept is the Ressence of many firsts but one in particular. It is equipped with e-Crown: An in-house electro-mechanical embedded system capable of registering, monitoring, adjusting and most importantly setting the time of the Type 2 e- Crown Concept without human intervention. It is essential to notice that the Type 2 e- Crown Concept is a cognitive mechanical watch, meaning the watch learns the time you set and does not rely on external signals (such as radio or gps). e-Crown does not only replace the crown but exceed it in terms of convenience and performance. It is controlled by simply tapping the glass of the Type 2 e-Crown Concept. A double tap awakes the embedded system while a single tap pilots the selector in the mode menu. Located on a sub-disc, the selector always indicates in what mode you are in. You can set and display two time zones manually via the lever on the case-back or connect via Bluetooth with the e-Crown app. The e-Crown app is not compulsory but brings the Type 2 e-Crown Concept to an unseen level of ease and avant-gardism. Instead of manually setting the time zones, the app offers you a geolocation and a drop-down menu of cities. You can then choose, pre-set and finally send the time zones information to the Type 2 e-Crown Concept. Accurate to the second, it has never been more user-friendly to change time zones on a fully mechanical watch. 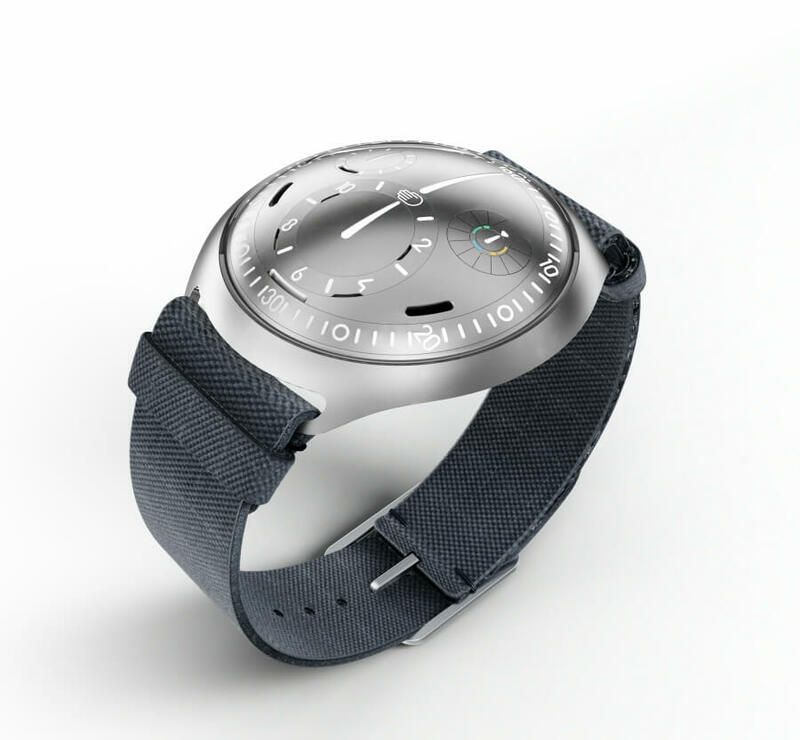 If set via the app, the Type 2 e-Crown Concept will even change winter or summer time automatically. Furthermore, the e-Crown app offers you the comfort of being notified when to service your watch as it will monitor the accuracy on a daily basis. The Type 2 e-Crown Concept is a fully self-sufficient mechanical watch relying on two natural sources of energy: Wrist movement and outside light. The automatic base movement is powered by a self-winding rotor while the e-Crown is powered by a kinetic generator and photovoltaic cells. The kinetic generator, made of grade 5 Titanium, surrounds the base movement and has its own barrel. The custom-build and developed triple junction photovoltaic cells are hidden under 10 micro-shutters (one shutter measures 2x3mm) located around the selector sub-disc. They will open automatically when the energy balance is low and can be controlled via the app. The Type 2 e-Crown Concept capabilities and experience vary according to the way you use it. In full e-Crown mode (e-Crown + App setting) your watch is set and adjusted to the second by your smart-phone. In semi e-Crown mode (e-Crown + Manual setting) your watch is set and adjusted to the minute. In mechanical mode (no e-Crown + Manual setting) your watch is running without any assistance, like in the “good” old days of traditional fine- watchmaking. Although strikingly innovative, the new electro-mechanical technologies implemented are, as always with Ressence, relegated behind the scenes. What is more important is the sensation of the user on looking at and touching a watch that seems to project the temporal indications onto the glass. The Type 2 e-Crown Concept is Ressence’s answer on how to improve the mechanical watch of today by incorporating technologies of tomorrow. The Type 2 in its production version will be available in stores as of June 2018. For more visit Ressence Online.